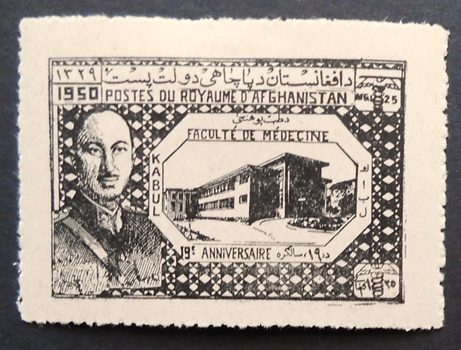 This came to me identified as Scott 368, which is the higher value in the 1950 set for the 19th anniversary of the Afghanistan Medical facility. Size is right for the issue, 46 x 30 mm, but it's in black. Scott 368 is the same design as Scott 367, which differs from this stamp. Did you look at 368a just below #368? It's there, at least in the 2017 catalog. Thanks, but that's an error of color, so it would be the same design as the regular stamp. I actually looked a bit more and found it is a Postal Tax Stamp RA10. Sure as crud you're correct. Darn, I got my one mistake for the year. I'll have to be careful now until 2020!